They might be secure, give better braking and so on, but what a frustrating system! I've had the wheels on and off a few times over the last couple of days – been fitting mudguards and also had one puncture – and while removing the wheels is easy and quick, putting them back is not. Getting the axle through the first drop out (or whatever you call it when it doesn't actually drop out!) and into the hub is painless, but getting that to align with the other side while simultaneously putting enough pressure and twisting the axle to catch the thread always takes a couple of minutes of frustration. Do other people have similar difficulties with this? What's the trick to it? Sorry if the answer appears unhelpful, but "practice, practice, practice". Do it a dozen times in your kitchen / garden / workshop and you soon get the knack. Should I get jiggy with the long hard rod or the gaping round hole? I suppose it's whichever takes my fancy! And if that doesn't work, jiggle the axle. Havent found it a problem to be honest. A gentle jiggle to allow the end of the rod to find and slip into the hole. I guess im just naturally good at it. not done it often, bit of a thru-axle virgin really but found it easy enough the first time. I have rear-facing track drop-outs on my single speed.. with mudguards. It can't be worse than that. no problem at all if the mudguards are of the right length and installed with the easy wheel removal in mind. Or if you use those quick-release attachments for the stays like front mudguards tend to use? I wonder how many times those can be used before the plastic pop-off bits wear too much to keep the stays in place over rough ground? I guess they're cheap enough (?) that even if they do wear out - and I think it would take some time - you can just replace them. Meanwhile I shall practice my wiggling at every opportunity. Fair enough. I've only ever used them on the front, which tends not to get many release/insert cycles. I wonder how many times those can be used before the plastic pop-off bits wear too much to keep the stays in place over rough ground? Ooh, about a year I would say. Speed bumps are the most annoying. 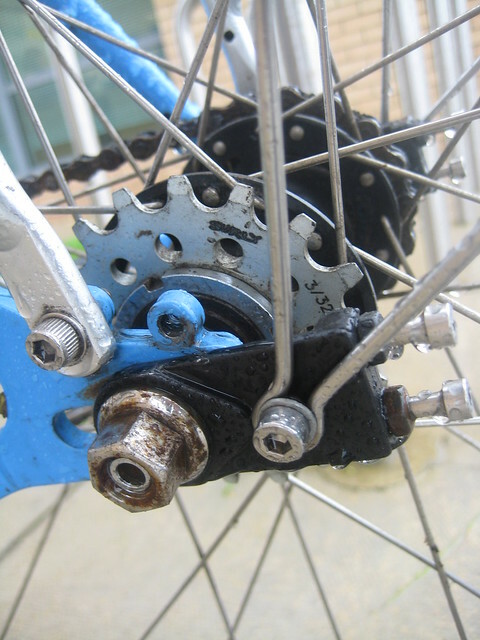 I added o-rings that looped between the stays and the wheelnuts before the mudguard finally split in half, from too much flexing getting the wheel in and out, somewhere between Taunton and Guildford last Sunday. That's the problem of having one frame but commuter and audax wheelsets that are swapped on a regular basis. I'm solving this over the winter with an n+1. IME, it depends on your tolerance to rattling. I had these on the back of my Pearson, they lasted several years before they worked loose and all I did was ease the stays a bit to tighten them up, I think I'd had them on for over 5 years before I replaced them. Do other people have similar difficulties with this? What's the trick to it? Got a puncture today (Specialized's tyres are really not very tough) and had no trouble whatsoever putting the wheel back, despite cold fingers. So maybe I've had enough practice. Or maybe it needs to be 5 deg or lower for the metal to contract that fraction a mm to open up the clearances. Or... whatever.